The highest quality materials and the most advanced technology have produced a line which gives the sensitivity, tenacity, and ruggedness under extreme stress that top professionals demand. 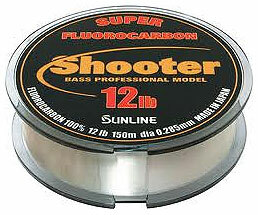 Sunline's Shooter Fluorocarbon Line was created to be used in all applications and to be available in more sizes. This series is Sunline's highest quality fluorocarbon. It is the best fluorocarbon product for flipping or when maximum abrasion resistance is needed. Extreme abrasion resistance and sensitivity. Designed for heavy cover applications. Lowest stretch. Stiffer than FC Sniper. Parallel spooling to insure the lowest memory. Triple resin processing.